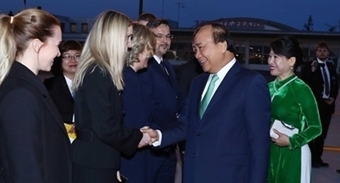 PSNews – Senior Lieutenant General Le Quy Vuong, Deputy Minister of Public Security on November 27 led a delegation to work with the Quang Ninh Provincial Police Department. The event saw the participation of Chairman of the Quang Ninh Provincial People’s Committee Nguyen Duc Long. Senior Colonel Do Van Luc, Director of the Quang Ninh Provincial Police Department briefed the delegates on the unit’s task performance in 2018. Deputy Minister Le Quy Vuong inspects task performance of Quang Ninh Police. According to Senior Colonel Do Van Luc, the Quang Ninh police have taken a great resolve to fulfill their assigned missions, and gained various remarkable results. They focused on maintaining the police discipline, working styles and good attitudes among police officers while serving the people. The Quang Ninh Provincial Police Department also asked its subordinate units to build concrete action plans and practical targets for emulation movements based on the real situation of each locality. The local police units also took initiative in grasping the situation, actively advised local Party committees at all levels of the province to deal with issues of security and order and to promote the building of the People’s Public Security Forces. Senior Colonel Do Van Luc emphasized that the Quang Ninh police also well improved the effectiveness of applying police professional measures, and strengthened external relations and international cooperation while accelerating administrative reforms and well implementing technical and logistic works. During the working session, the head of the Quang Ninh Provincial Police Department also pointed out some shortcomings and difficulties of the local police in performing their tasks, and gave some proposals to the Deputy Minister of Public Security. Speaking at the event, Senior Lieutenant General le Quy Vuong spoke highly of the Quang Ninh Provincial Police’s task performance in 2018. He praised the active spirit of the local force in implementing various measures to fight crimes and prevent complex situations from occurring in the province. The Deputy Minister of Public Security also praised the units’ achievements in Party work and force building, and realizing the Ministry of Public Security’s instructions on renovating and streamlining the force for effectiveness and efficiency. Deputy Minister Vuong asked the Quang Ninh Provincial Police to better perform their major missions while also focusing on maintaining traffic safety and the order in immigration work, imposing strict discipline, and promoting internal unity. Deputy Minister Vuong also requested the unit to continue efforts to accomplish their remaining 2018 tasks and draw up plans to suppress criminals during the upcoming 2019 Lunar New Year festival. Tag Deputy Minister Le Quy Vuong Quang Ninh police Quang Ninh Provincial Police Department.